← Santa Is Coming Down Your Chimney Tonight … Pops! Cover a tray with parchment or wax paper. 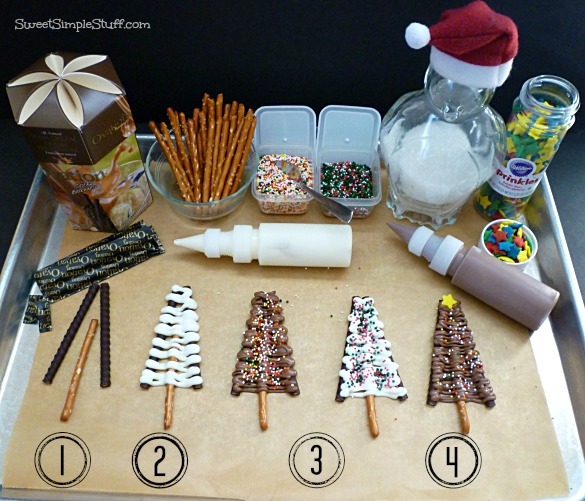 Melt the candy coating according to directions on the package and place in squeeze bottles or disposable pastry bags. 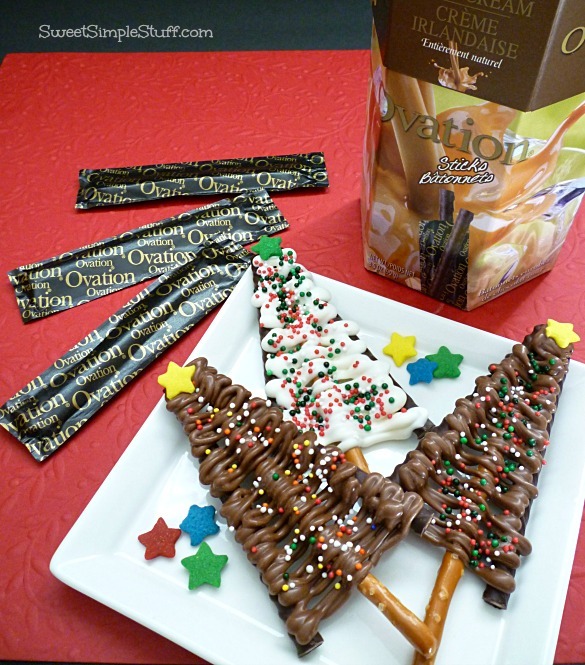 Make a tree shape using a pretzel stick as the trunk and 2 Ovation Sticks. This is like coloring within the lines … only using chocolate and squiggling within the lines. You may want to do it twice if the squiggles are too far apart. Add a star. Chill for a few minutes or let sit at room temperature until hardened. DONE! 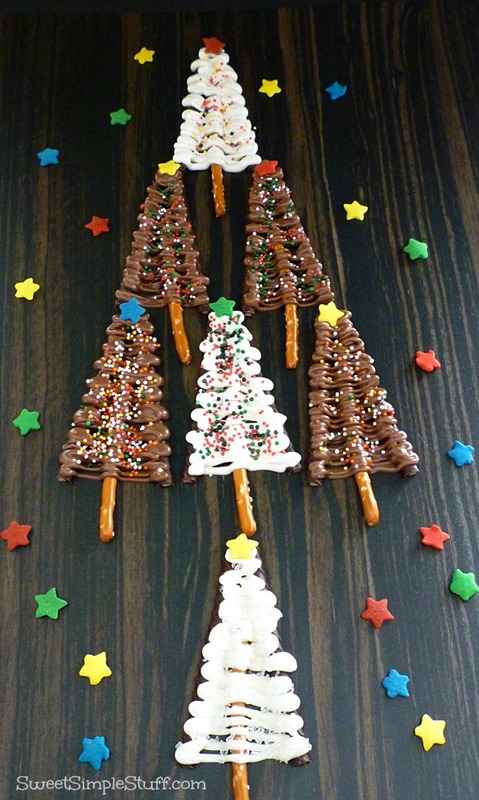 Just a few of these trees could dress up any cookie platter! Do you have everything ready? Are you one of those organized people (not like me)? I love your comments! Thank you so much Barbara 🙂 I wish the same for you! They look awesome, so simple as well! Oh how cool are these! My daughter,granddaughter & I could all set at the kitchen table & make them together. Are you going to show us the Igloo & lighted penguin? Or are you going to make us wait till you finish it? Thank you Beth 🙂 I wish you the same! I am in the same boat. I should be downstairs finishing the cookies and breads for neighbors and friends and here I am looking at more Christmas ideas and food. (I will go down in a min, really) This is such a cute idea and so easy, I’m going to get what I need at the store and do them tomorrow. Happy Holidays everyone. Thank you Jacquie 😉 It seems like we have a lot in common! Happy Holidays to you! Thank you for all the wonderful ideas! May you and your family have a wonderful Christmas and be blessed in the New Year! Thank you Lucinda 🙂 I wish you the same! 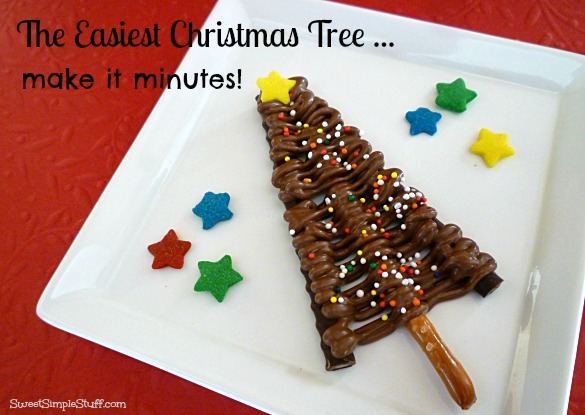 This is such a simple and cute idea! And looks delicious too! Thank you so much 😉 Merry Christmas! I’ve seen these on the net, but naturally yours are nicer. The others just had the pretzel down the center – no side pieces. Thanks for “caving” and posting yours. You’re my type of person – collecting 100 milk jugs to make an igloo for your penguin – love it. Oh yes – we want a photo. Let me know if the hot glue holds in the cold weather. I went to Alaska on a wilderness trip & the last night they told us we had to build igloos & sleep out over night. It got colder & colder as a storm came in & they had to scrap the idea. Thank goodness. Fla. people in igloos – no – there was something inherently wrong with that plan. Hope you and your family (which includes your star gazing penguin) have a wonderful, wonderful Christmas. Have been enjoying the snow falling on your website. I just realized your falling snowflakes are following my cursor! They always fall in a downward motion but if my cursor goes to the right – so do the snowflakes. Move cursor to the left and they fall down and to the left. How the heck did you do that? Very clever. I just changed my background color … hope the snow shows up better 😉 All I did was check the box that asked me if I want to enable snow! Thank you Tavette 😉 I had a little help collecting the jugs … was storing them in my trailer … had to find a new place when it was time to go camping! They moved to the garden shed … now in the front yard … I know that hot glue will pop off if frozen … we will see what happens! Glad you are enjoying the snow … I can’t see it unless I’m signed out of my own blog … I don’t get that! Thanks Colleen, for setting this Florida gal straight on the snowflakes (aka sprinkles). Wow – even her snow is edible! Colleen … you are too kind … thank you 😉 Ok, they do like white sprinkles! Merry Christmas to you! 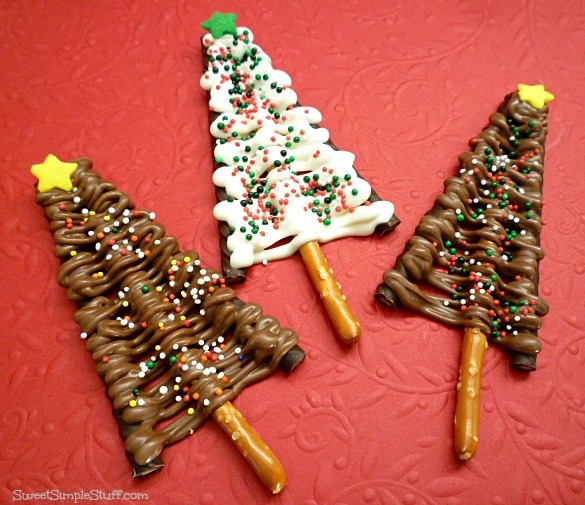 I love your chocolate trees – they are too cute to be so easy! 🙂 Merry Christmas! What a great idea, my grandchildren would love these! Thank you so much Michael 😉 I wish the same to you and your family!